I found pea shoots at Whole Foods a few weeks ago and impulsively bought them. It is not unusual for me to buy unique food items to try in new recipes but I just wasn't sure about the pea shoots. Their appearance was bright, fresh and very crisp looking. They were beautiful. This is what drew my eye to them. I am trying so hard to eat more salads. I just get bored easily with the same salad ingredients that I have on hand. 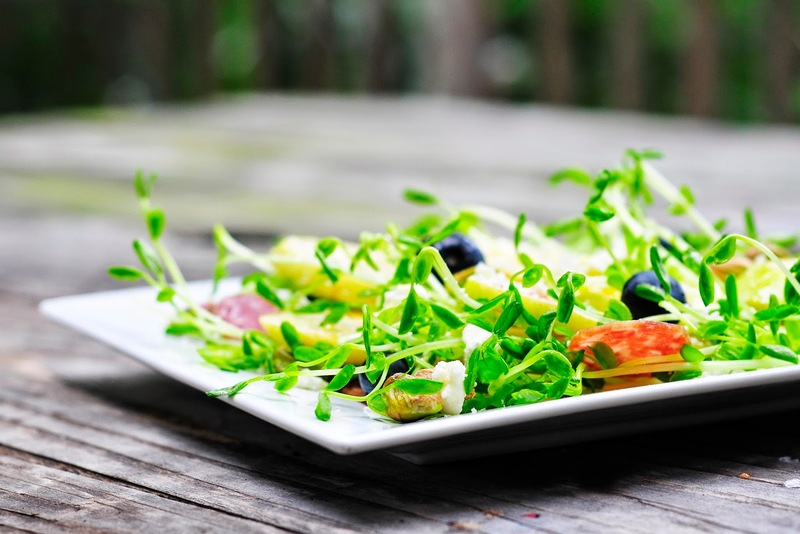 The pea shoots are a great addition to this simple yet elegant lunch salad. I thought that peas and pears would go well together visually, as well as, blend together to make a nice sweet bite. To counter the sweetness I added some sliced salami. I think proscuttio would also add a nice balance to the sweet fruit. I threw in some pistachios for crunch and blueberries to balance the color palette of the plate. This is a recipe that doesn't need a recipe because it was literally thrown together for a quick lunch but when I saw it composed on the plate, I knew I had to share and take a few photos. Enjoy this salad. I hope that you can find pea shoots in your neck of the woods. If not, I am sure any sprouted grain or sprout would work in place of the pea shoots. Dressing: I used extra virgin olive oil and some lemon balsamic vinegar drizzled across the salad. 1. Arrange ingredients on your plate and then eat. This is simply stunning! What a wonderful combo of flavors and of course colors. You're watching out for our palette AND our palate, eh? We're going to share on our sites and link here so people can see how you did this. Great recipe! Gorgeous and sounds just amazing! 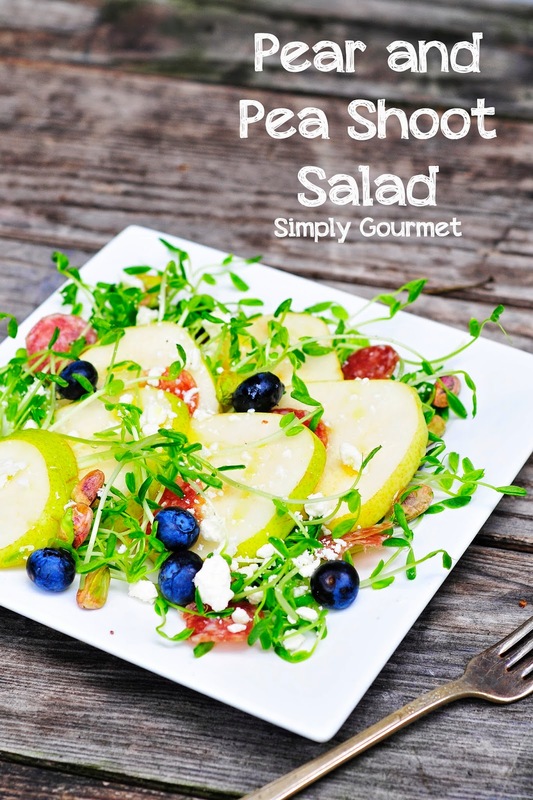 Your pea shoot pear combo looks delish. Chopped combos are what I do. 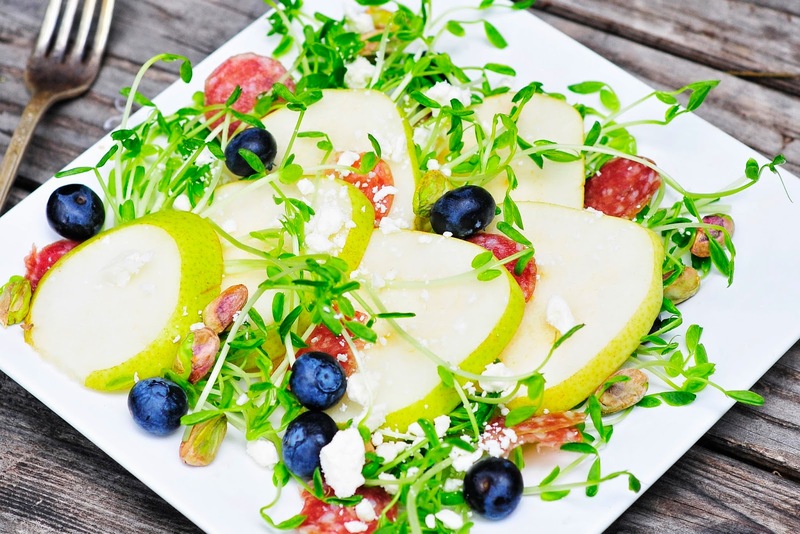 (if you'd like some ideas visit my site) Thanks for sharing this healthful dish at #theWeekendSocial. Pinning. Can't wait to see what you bring to the table Thursday 9:00 PM EST.